Former Huddersfield Town loanee Kasey Palmer struck in added time to deny Leeds United a first win since Boxing Day and earn Derby County a draw. Palmer, on as a substitute, pounced to lash home after Leeds failed to clear a corner and secure a vital point. Leeds lead twice and thought they had won it when Ezgjan Alioski finished off a counter attack to regain the lead to add to Pierre-Michel Lasogga's opener. Andreas Weimann had earlier levelled for Derby, who remain in fourth place. By contrast Leeds are eight points off the top six, and it is they who will feel the loss of those two points most. Changes played a key role in both sides' second-half flurry as Samuel Saiz and Alioski came off the bench to make a huge impact for Leeds, as Palmer did for the hosts. The bitterness between these two teams goes back to the early 1970s and Brian Clough and Don Revie's personal rivalry, long before many fans in the stands were born, although the terrace chant sparring between the fans suggested the embers still burn bright. Promotion is the aim of both sides bidding to return to those glory days and Gary Rowett's Rams began with purpose, having lost for the first time in 13 at the weekend, and might have been ahead but David Nugent nodded a Tom Lawrence cross wide. That wastefulness was made to pay when Lasogga nodded in ahead of Scott Carson after Stuart Dallas was set away down the right on Leeds' first meaningful break. Lawrence rapped the bar with a swerving drive as the Rams mounted an immediate response and with seconds to play of added time, Weimann rifled past Felix Wiedwald after Liam Cooper's attempted clearance glanced into his path. It was a much closer second half with fewer clear-cut chances as Nugent skewed his shot well wide after half-time, while Liam Cooper headed over a swinging Pablo Hernandez cross. With both teams rotating their line-up as time ticked on, Saiz and Alioski combined for a suckerpunch goal after Palmer's free-kick for Derby was blocked, and Paul Heckingbottom could almost taste his first win as Leeds boss. 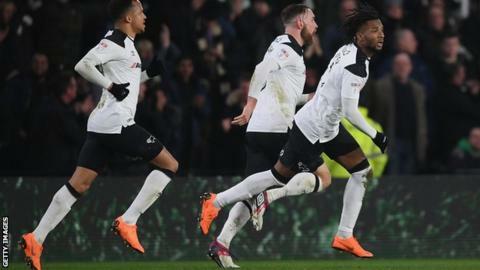 However Palmer, on loan from Chelsea for the season, scrambled in to make amends and ensure Derby avoided back-to-back league losses for the first time this season. "The goals we gave away tonight were very, very poor. We can't afford to give Leeds a free header from three yards out. It was their only chance of the half. "The first-half was the best we've played: we had 25 chances to their eight, then it all became a bit frantic, we were trying to force the ball forward. "Thankfully we got our composure back and got the equaliser, but unfortunately we ran out of time. It just feels like someone doesn't want us to win a game at the moment. We've played well again, we just haven't put away the chances." "I'm gutted for them. I'm disappointed for the lads, not with them. I'm stood there on 85 minutes thinking about tomorrow's post-match review, everything I'm going to show them that won them the game in terms of the quality, resilience, the work rate, putting bodies on line. "All bits we've been speaking about and we didn't get the result I think we deserved because of all those factors, we've been undone at the back end of the half, which makes the game feel worse. "I'd rather take three points than the positives, but my message to the players is get your heads up, come out feeling high. I was pleased with lots of things, but I saw things we need to get better at which in my eyes is pleasing because I know we can get better."